The GoPro sports camera was the star of my Harley-riding father’s Christmas last year. 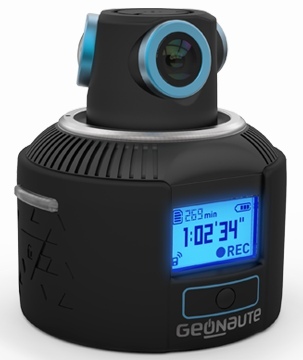 This year, he may very well be tempted by the next generation of action photography: French company Geonaute unveiled its final design for a mounted 360-degree sports action camera, also called Geonaute, at this year’s Consumer Electronics Show in Las Vegas. The Geonaute, designed to be mounted to a piece of sports equipment such as a helmet, uses three different wide-angle camera lenses to create a 360-degree horizontal and 150-degree vertical view of the world. It’s capable of recording video in 2048x1024 (2K) at 25 FPS and taking photos in 4K ultra HD. The camera also includes a timer setting, 6 FPS burst photos and a time-lapse mode. You’ll need to use Geonaute’s editing tools to perfect your video, since you’re really looking at three cameras worth of video. Based on what I saw on display at CES, this is far less intimidating as it sounds. Once you’re ready to show your work off, you can view it on your own computer or smartphone or upload it for free to Geonaute’s web platform. Certainly 360-degree photography is nothing new – recent Android devices are capable of creating 3D photospheres already. What I like about the Geonaute is that it seems like the most complete and market-ready 3D video sports camera on display. The design is pretty attractive too, and at 9-ounces, it’s light enough to mount on a helmet without feeling too weighed down. As an added bonus, GoPro owners will find many of their accessories to be compatible with the Geonaute. The Geonaute is slated for release later this spring at a price of $499 in the U.S. Those who register to pre-order will be eligible for a free $40 accessory set and free shipping. For more on the device, to browse 3D videos shot by the Geonaute crew or to register, visit the company’s website at geonaute.com.